Welcome to the Fountain Paint Pot Online Tour. To navigate this tour of geothermal features, simply click next stop at the bottom of each page. If you prefer you may select features from the List of Stops or from the Interactive Map. 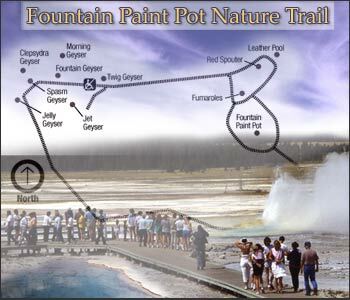 On this tour you will see various hydrothermal features, expressions of Yellowstone's volcanism. No two features are exactly alike, yet they can be grouped into those that have a lot of water (hot springs and geysers), those that have a limited amount of water (mudpots and fumaroles). As you walk this trail, you'll learn about these features and their volcanic origins.